The unarmed woman who was shot and killed following a car chase that began at the White House and ended near the Capitol has been identified as a Stamford, Conn., resident originally from New York City, according to multiple law enforcement sources. 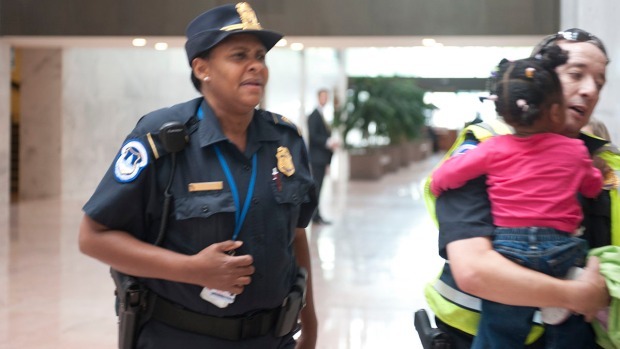 The sources say Miriam Carey, 34, tried to ram her car through a White House barricade before leading police on a high-speed chase that put the Capitol on lockdown and ended in a hail of gunfire. A woman identified by multiple law enforcement as Miriam Carey, 34, of Stamford, Conn. is seen driving a black Infiniti. 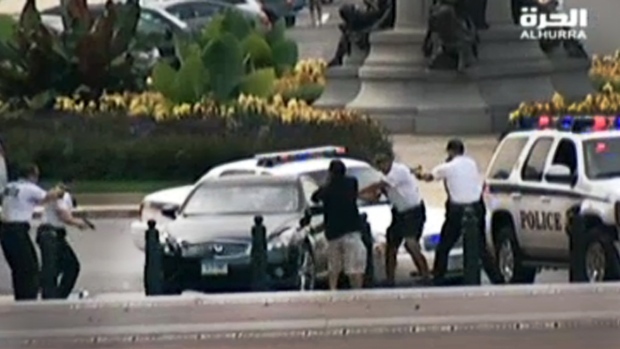 Carey tried to ram through a White House barricade Thursday, then led police on a chase that ended in gunfire outside the Capitol, witnesses and officials said. This video is courtesy of Alhurra Television, a U.S. government-funded TV network. Authorities were searching her Connecticut home for clues and speaking with her relatives in Brooklyn and Staten Island. Police were posted outside Carey's sister's home in the Bedford-Stuyvesant section of Brooklyn, and the block was closed off by NYPD. Relatives told investigators that Carey suffered from a fall some time ago and began to suffer mental issues, according to a senior law enforcement official. Carey's former employer in Connecticut said she was out of work for two to three weeks in January 2012 after the fall. Miriam Carey had a good relationship with her mother and her sisters, one of whom is a retired NYPD sergeant, sources told NBC 4 New York. The Washington Post reported that one of Carey's sisters, a Brooklyn nurse named Amy, was incredulous when told about had happened outside the Capitol. "That's impossible. She works, she holds a job," said Amy Carey. The newspaper reports Miriam Carey had four sisters. It's not clear if Amy is the sister who lives in the Bedford-Stuyvesant brownstone. "She wouldn't be in D.C.," she said. "She was just in Connecticut two days ago, I spoke to her... I don't know what's happening." A property manager at the Stamford condominium complex where Carey lived confirmed an extensive investigation by multiple agencies. "A full investigation is underway by federal authorities who are in Stamford currently," said Mayor Michael A. Pavia in a statement. "Stamford Police are assisting federal authorities as needed." Carey, a dental hygienist, was the mother of a one-year-old child, who was in the car during the shooting and chase, according to officials. The child is said to be OK at a Washington hospital. Carey's former employer in Connecticut, dentist Barry Weiss, told NBC Connecticut that she was "an average employee." "There were a few instances of her being headstrong, but generally she was an average employee," Weiss said. "She did her job and left at the end of the day." Weiss said Carey "could be a bit rough," and after complaints from patients, she was fired in August 2012. "Nothing would have led us to think she would have done this," said Weiss. The Washington Post reports Carey attended Hostos Community College in the Bronx and graduated with an associate's degree in dental hygiene. She then graduated from Brooklyn College in 2007 with a bachelor's degree in health and nutrition science. NBC's Pete Williams, Richard Esposito, Robert Windrem, Shimon Prokupecz, Matthew Cole and Andrew Siff contributed to this report.